﻿ Steel Frame Machine Features - RISHBIN WUXI CO., LTD.
Steel frame machine uses the strip steel as raw material, through the continuous cold roll forming, for the production of complex cross-section profile (products are: light steel frame, paint steel frame, cassette frame, and all kinds of building material, steel structure, steel lining doorframe profile, high barrier, etc.) and different specifications of the cold bending, paint unit equipment, adopting PLC control. 1. The rolling capacity of the unit: the width is less than or equal to 150mm, and the thickness of the plate is 0.6-2.0mm. 3. Total installed capacity: about 5.5kw. 4. Production floor area: 15m long X 2.5m. 5. The equipment is controlled by PLC, and multiple safety protection is set up during normal production. 6. The bed is welded with steel plate. It is also used for tempering, eliminating internal stress and avoiding deformation of the fuselage. 7. The steel frame machine is cast iron structure and is treated by tempering. High strength and long service life. 8. The material of the rolling roller is 40Cr, and the hardness is HB280. 9. The molding material for GCr15, quenching treatment, hardness: HRC56-62 ℃. 10. Transmission structure is gearbox transmission. Each steel frame roll forming machine has a light gauge steel framing machines. It can guarantee the equipment work with high strength operation and long service life. 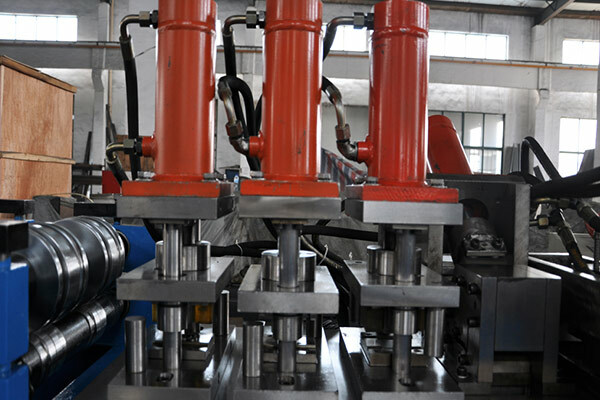 Processing technology of steel frame machine: feed - guide - roll forming - cutting - receiving. Equipment composition: feeding machine, guide frame, roll forming, the calibration device, cutting part, charging station, the electrical control part and so on.